With recent headlines sharing news of cultural atrocities across Syria and Iraq, we found it heartening to receive news of al-Qarawiyyin, the world's oldest library soon to open to the public once more. We take a look at its storied past. Founded in 860, Qarawiyyin is believed to be the oldest working library in the world. It is part of Qarawiyyin University which, according to the UN, is the oldest operating educational institute in the world. Alumni include the Jewish philosopher Moses Maimonides, the Muslim historian Ibn Khaldun, and the Andalusian diplomat Leo Africanus. The library was established by Fatima al-Fihri, the daughter of a prosperous merchant from Tunisia who vowed to spend her inheritance on building a mosque and knowledge center for her community. Fittingly, the complex restoration project was awarded to a woman: architect Aziza Chaouni who, according to the Guardian, was pleasantly surprised that her architecture firm won the contract in a field traditionally seen as a man’s province. After operating for over a millennium, Qarawiyyin library fell into serious disrepair. Neglect, lack of financial support, heat and unregulated humidity threatened to destroy the precious manuscripts housed inside. "When I first visited, I was shocked at the state of the place," Aziza wrote earlier this year at TED.com. "In rooms containing precious manuscripts, the temperature and moisture were uncontrolled, and there were cracks in the ceiling." Aziza and her team have restored the site not only as a monument to the past but as a living, breathing part of the city. 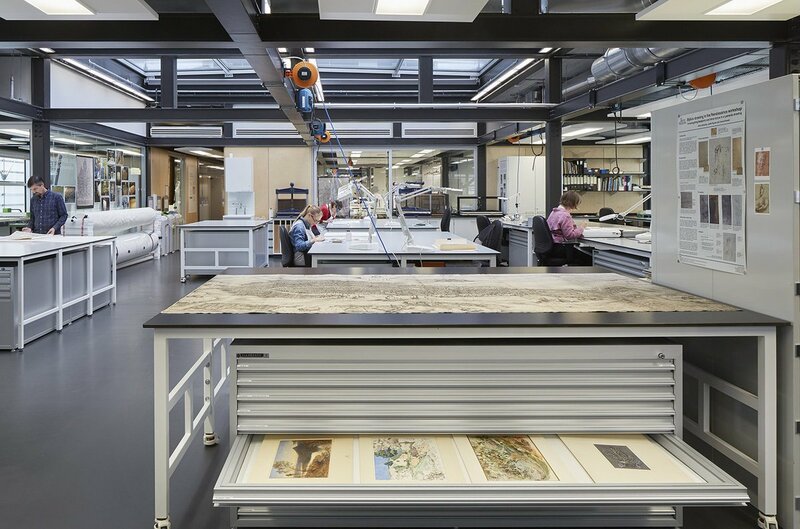 "There has to be a fine balance between keeping the original spaces, addressing the needs of current users, including students, researchers and visitors, and integrating new sustainable technologies," says Aziza. Qarawiyyin houses thousands of precious manuscripts, some dating as far back as the 7th century. The collection covers everything from law to astronomy and includes the earliest Islamic hadiths (the words and actions of Islam's prophet Mohammed) as well as an original copy of historian Ibn Khaldun's Muqaddimah, which records an early view of universal history. The Qur’an is written in ornate Kufic script on camel skin and is now kept in a secure room with strict temperature and humidity control. The Guardian reports that the original manuscript room held works of such immense import that each of the four locks had separate keys held by four different individuals, all of whom had to be present for the door to be opened. Qarawiyyin played a leading role in the transfer of knowledge between Muslims and Europeans. In the 10th century, Pope Sylvester II, known as a prolific scholar, was one of the visitors. After the complex restoration, the library now benefits from a new gutter system, solar panels and air conditioning units which are tucked behind wooden carvings that match the aesthetic. The most precious manuscripts are protected in a temperature- and humidity-controlled room with a modern security system. The restoration project has enjoyed royal backing with Morroco’s current monarch, King Mohammad VI, visiting the work in June. He is also expected to inaugurate the public reopening. 10. You can visit it soon! The library is expected to be reopened for visitors later this year. The restored site will include a reading room, a conference room, a manuscript restoration laboratory, and a rare books collection along with new administrative offices and a café. Aziza also commissioned furniture from local craftsmen who used native wood, and built courtyard umbrellas that provide shade and mist on hot summer days. Support heritage conservation in the UK and beyond: Join Icon as a Supporter for only £50 a year.